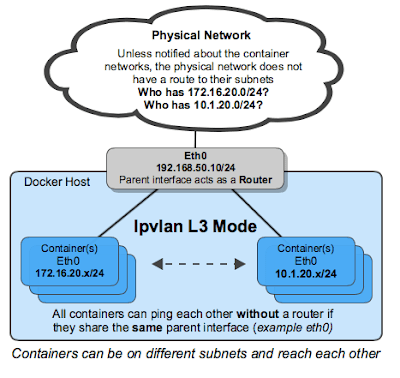 Macvlan and Ipvlan Network Drivers are being added as Docker networking options. The IPVlan L3 Mode shown in the diagram is particularly interesting since it dramatically simplifies the network by extending routing to the hosts and eliminating switching entirely. 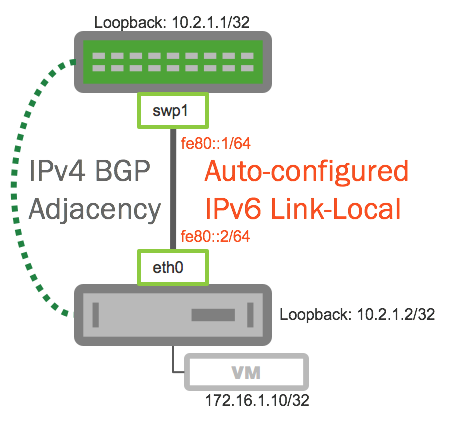 IPVlan will require routes to be distributed to each endpoint. The driver only builds the Ipvlan L3 mode port and attaches the container to the interface. Route distribution throughout a cluster is beyond the initial implementation of this single host scoped driver. In L3 mode, the Docker host is very similar to a router starting new networks in the container. They are on networks that the upstream network will not know about without route distribution. Cumulus Networks has been working to simplify routing in the ECMP leaf and spine networks and the white paper Routing on the Host: An Introduction shows how the routing configuration used on Cumulus Linux can be extended to the hosts. Update June 2, 2016: Routing on the Host contains packaged versions of the Cumulus Quagga daemon for Ubuntu, Redhat and Docker. This article explores the combination of Cumulus Linux networking with Docker IPVLAN using a simple test bed built using free software: VirtualBox, CumulusVX switches, and Ubuntu 16.04 servers. This setup should result in a simple, easy to manage, easy to monitor, networking solution for Docker since all the switches and server will be running Linux allowing the same routing, monitoring, and orchestration software to be used throughout. Auto-configured IPv6 link local addresses dramatically simplify the configuration of equal cost multi-path (ECMP) routing, eliminating the need to assign IP addresses and subnets to the routed switch ports. The simplified configuration is easy to template, all the switches have a very similar configuration, and an orchestration tool like Puppet, Chef, Ansible, Salt, etc. can be used to automate the process of configuring the switches. Two Ubuntu 16.04 hosts were created, attached to leaf1 and leaf2 respectively. 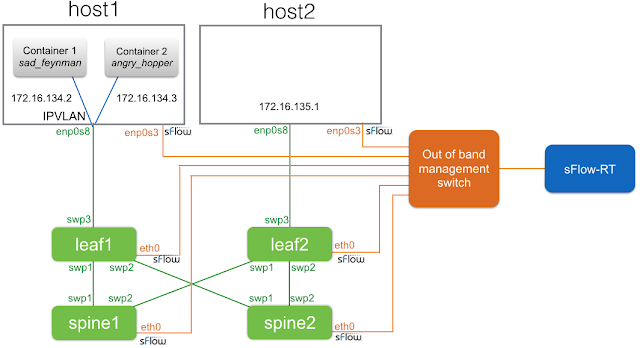 Each server has two network adapters: enp0s3 connected to the out of band network used to manage the switches and enp0s8 connected to the respective leaf switch. Why the strange Ethernet interface names (e.g. enp0s3 instead of eth0)? They are the result of the predictable network interface names mechanism that is the default in Ubuntu 16.04. I can't say I am a fan, predictable interface names are difficult to read, push the problem of device naming up the stack, and make it difficult to write portable orchestration scripts. The IPVLAN route-map is used to control the routes that are advertised, limiting them to the range of addresses that have been allocated to the IPVLAN orchestration system. Route filtering is an example of the flexibility that BGP brings as a routing protocol: top of rack switches can filter routes advertised by the hosts to protect the fabric from misconfigured hosts, and hosts can be configured to selectively advertise routes. PING 172.16.134.1 (172.16.134.1) 56(84) bytes of data. Ubuntu 16.04 was selected as the host operating system since it has built-in IPVLAN support. Docker Experimental Features distribution, which includes the IPVLAN Docker networking plugin, is installed on the two hosts. Note: Route(s) to the IPVLAN network would be automatically distributed if the above command had an option to attach the subnets to the parent interface. PING 172.16.134.2 (172.16.134.2) 56(84) bytes of data. Now that we have end to end connectivity, how can we monitor traffic? Update July 22, 2016: sFlow-RT can now be run from Docker Hub, see sflow/sflow-rt for instructions. Monitoring resources on the physical switches is critical to large scale IPVLAN deployments since the number of routes must be kept within the table sizes supported by the hardware. 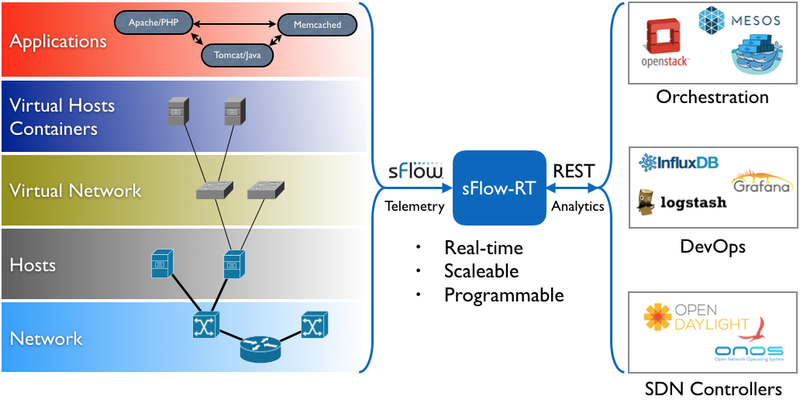 Broadcom ASIC table utilization metrics, DevOps, and SDN describes how sFlow exports hardware routing table metrics. The use of Cumulus Linux greatly simplified the configuration of the ECMP fabric and allowed a common set of routing, monitoring, and orchestration software to be used for both hosts and switches. A common set of tools dramatically simplifies the task of configuring, testing, and managing end to end Docker networking. Finally, end to end IP routing using the new Docker IPVLAN networking plugin is very promising. Eliminating overlays and bridging improves scaleability, reduces operational complexity, and facilitates automation using a mature routing control plane (BGP).